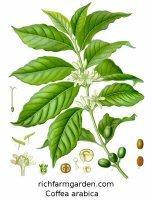 Coffee (Coffea arabica) Pretty shrub bearing clusters of sweet-smelling white blooms that mature into seeds that are dried and ground into commercial coffee. Makes an attractive and long lived potted plant, though care must be taken to never allow the plant to become pot-bound. Full sun; plant height: 8ft. 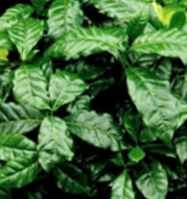 Dwarf coffee tree - Coffea arabica nana - Fast growing plant often used as an annual for bedding. Shiny pointed leaves. Great winter houseplant. Full sun or partial shade; height: 12in.